My treasure map will lead you right to it. Let me rescue you from the hum-drum baby Easter dresses lined up at your local mega-mart. There they hang, lifeless and limp, wallowing in the saddness of assembly-line style. 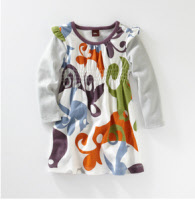 As your friendly neighborhood baby fashion pirate, allow me to reveal a treasure map to the most sophisticatedly cute baby Spring dresses in 2011. 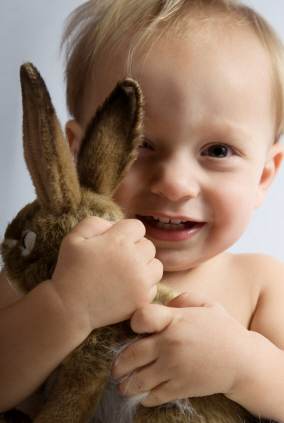 There's a New World of infant style just waiting for you to plunder. No tired-out-grumpy children hanging on the cart (or tired-out-grumpy mama pushing it). No, like, teeny-bopper, like, glaring at you because you, like, made her stop texting to checkout. Just you, tapping your fingers, gazing at some gorgeous photos, and (if you're lucky) breathing in a mug of coffee sending up swirls of steaming happiness. So grab that giant plummed hat and a stuffed parrot! Our looting adventure for the ultimate collection of baby girl Easter dresses will sail us into some exotic ports. We'll visit Isabella and Ferdinand in Espana...we'll break into a bargain chest or two... we'll lounge around some old favorites...we'll even fly our ship to Neverland in our quest to find adorable and affordable Spring frocks. Let's raise the anchor of apathetic expectations and cast-off for a new paradise of Easter dresses! P.S. After you've finished dreaming and drooling over these boutiques and finally made a decision about the baby Easter dress gracing your infant in 2011, you're going to want her picture on the wall. You've been warned. Now's the time to start saving those JCPenny Portrait coupons. The B. Swanky Boutique is just as cute as it sounds. 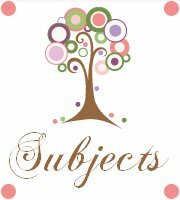 It's a little mom-and-pop online store that specializes in designs that come straight out of their heads, which is why, you can't find them anywhere else. They don't sell "everyday" clothes. 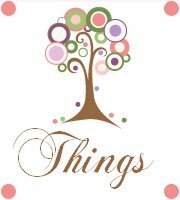 Their collection is 100% special occasion items for holiday and birthday celebrations. 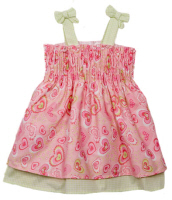 Currently, they have two styles of baby girl Easter dresses available. 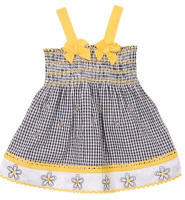 The first is the chick blue gingham dress seen at the top of the page. 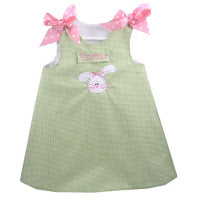 The second design is a green gingham with an embroidered bunny. Both can be personalized or monogrammed. The Tea Collection will not provide you with tea. Instead, they gather tasteful designs from all around the world, pleasing your palette for sophistication and sturdy clothing for your budding traveler. Easter 2011 is all about Espana. These dresses give a glimpse of the Catalonia culture that makes my heart long for a visit. 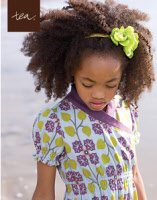 Your little Dulcinea will look so charming in these pastoral frocks. If you're home is a little farther from the warm waters of the Mediterranean, may I suggest looking at their Spanish-inspired sweaters and cardigans? Lounge around the gardens of Barcelona with these art nouveau designs. The bells of Barcelona will ring for this shirred waist and puffy-sleeved creation. Hemmingway would be impressed. This leafy floral canal blue print is a simple statement that makes a big impression. For the abstract-art-lover, this flint colored patterned dress is designed to look like a wood cut, but it feels like soft French terry. It looks gorgeous on an eight-year-old, and it will look gorgeous on an eight-month-old, even if she can't twirl in it yet. 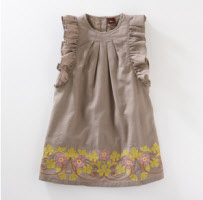 This fine wale corduroy dress was inspired by the beautiful hand-embroidered aprons worn by women in the countryside. HINT: This is on sale! Peacock feathers sprout from the hem of an orchard-orange beach frock. Bloomers are included. they would have worn this. by Casa Mila in Gaudi. It's a passport to refinement. If you liked the European designs at Tea Collection, feast your eyes on the the Swedish styles at Hanna Andersson. Right now they are promoting a Dress and Swim Sale to find adorable Spring and Summer suits and sundresses. This ends on April 4th! Always a personal favorite of mine, The Children's Place continues to please. 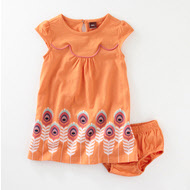 I've purchased baby Spring dresses from them nearly every year since Lauren was born (she's 7 now). Although, I must admit that I strayed in 2011. 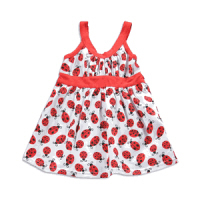 Still, they have some beautiful baby Spring dresses to choose from. 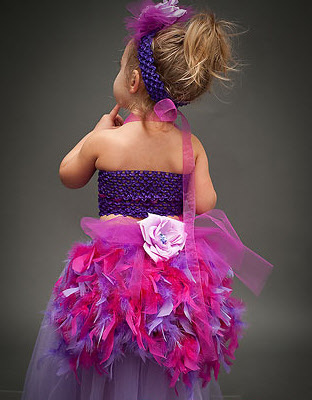 The first set of four dresses are from their formal baby Easter dresses and flower girl collections. 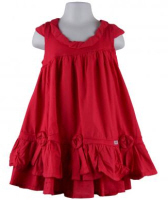 You can see their entire collection of formal baby wear by clicking here. Don't be fooled by "flower girl", this is Easter pink perfection. Of all the gowns at Children's Place this year, this one is my favorite. bright pink polka dots, and a matching sun hat, it's a new twist on a traditional design. This gorgeous periwinkle tutu dress looks especially refined with a white cardigan sweater, flower headwrap, and ballet slippers. HINT: They are all on sale! 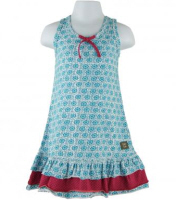 This ocean blue and seaweed green plaid dress has nautical rings on the straps. The ideal outfit to cruise around for eggs. The ultimate garden party frock has ribbon flowers adorning the hemline and a bodice trimmed with a layer of five lettuce ruffles. 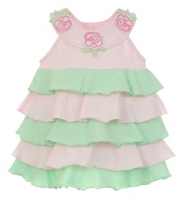 The ying and yang of this baby easter dress keeps it perfectly balanced between gentle femininity and tough cookie. A simple medallion-print with ribbon trim places the tropics right in your backyard. 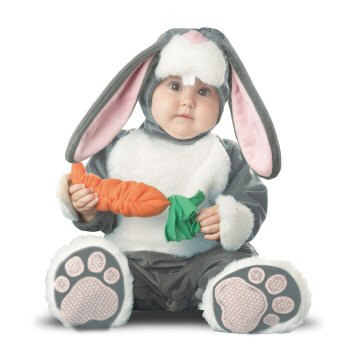 If you're budget-belt is a little tight this year, spending a lot of money on baby Easter dresses may not be wise. Never fear! 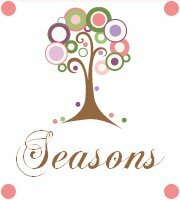 I've dug up a few web gems that will give you adorable clothing at affordable prices. The first of these bargain chests is Bargain Children's Clothing. 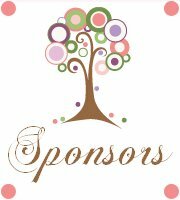 They take some of your favorite brands, like Mish, SnoPea, Cloud Mine, Mulberribush, and Plum Pudding and offer them at discounts 20-85% off. Order more than $100.00 and get $10 off with code SAVE10. 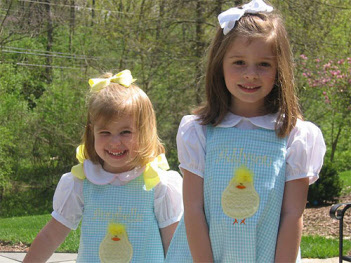 Here are four of their best-selling baby Easter dresses. 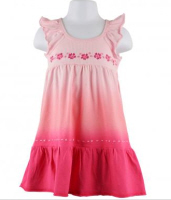 To see their entire collection of baby and newborn dresses, click here. 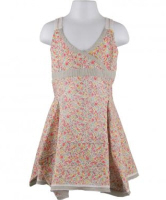 A dreamy picnic dress like this one is perfect for egg hunting in the grass. A satin sash and tiered lace skirt make this peach sundress absolultely darling. 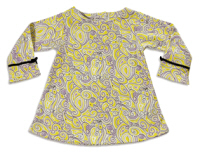 Step back into the sixties with a purple/yellow paisley long-sleeved gown by SnoPea. 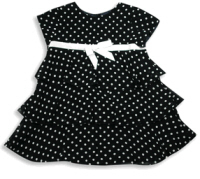 Sail away with this navy and white polka dot ruffle dress. 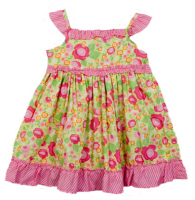 The second bargain chest of golden baby Easter dresses I have to uncover is The Children's Wear Outlet . What I really love about this online-only store is it's simplicity. Every single outfit is $10. Did you catch that I said outfit? This means that no matter how many items are included, hat, shirt, pants...anything, it's all $10 for the whole kit 'n kaboodle. (And sometimes it's as low as $6!) So forget the calculator. Budgeting made easy, just count by tens! 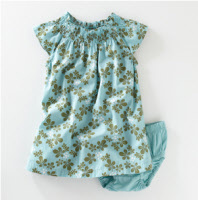 A two-piece breezy Easter dress with leggings, with gentle sea blue and daffodil yellow layers of ruffle. 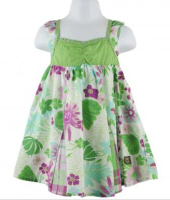 A gorgeous flowered print dress with feathery straps and ruffled hemline. 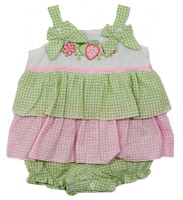 Asparagus colored gingham with strawberries embroidered on the top with bows and frills...an ideal bloomer set for Easter. 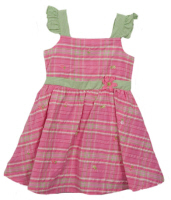 Teeny-tiny embroidered flowers are sprinkled across the pink and green plaid print on this gorgeous baby sundress. HINT: Currently marked down 64%. 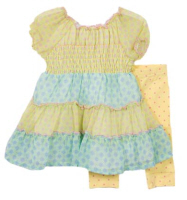 Citrus yellow polka dots, bow-straps, and applique daisies create the dainty details that set this darling frock apart. HINT: See this 64% off. 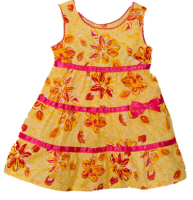 A lovely pink and yellow floral dress is graced with three layers lined with satin ribbons tieing it all into a Hawaiian paradise. HINT: Find it at a 63% reduced price. 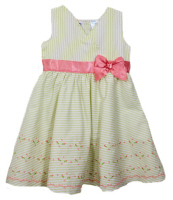 A gathered ribbed bodice flairs into a retro-heart print simple yet stunning sundress with light green petticoat. When I think of Hartstrings, I think Hamptons. Their designs are gorgeous Hepburn-inspired creations that have just the perfect amount of whimsy. 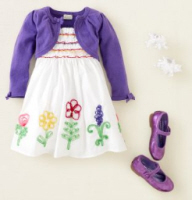 Unlike department stores and other mass merchandisers, Hartstrings choses a fabric or pattern and then develops a whole theme of baby Easter dresses and clothing to surround those patterns. This makes coordinating outfits incredibly simple. It's also a great help to mothers with several daughters (like myself). I can get the girls all matching, without putting them all in exactly the same dress. 10% off everything on the website with code CJ10OFF. Free shipping on orders over $75 with code CJFS75. Here are the designs new for 2011. 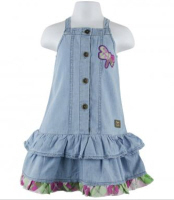 Simply click on each collection to view the baby Easter dresses and other clothing items designed within that style. 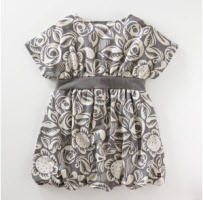 This year I discovered a new gold-mine of adorable clothing and chose a baby Easter dress for Isabella at Naartjie Kids. The dresses are so wispy and fairy-like. It's gypsy meets Tinker Bell. I love absolutely everything in their store. 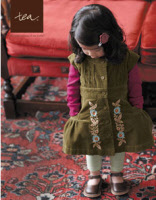 See the original Neverland clothing at Naartjie Kids - from baby Easter dresses all the way up to size 10. 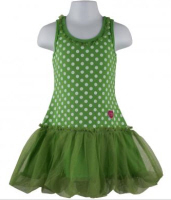 Here are a few of their gorgeous fairy baby Easter dresses. Click on the banner below, or the banner to the left to browse. Every style comes in a variety of different colors, so be sure to visit Naartjie and see if there's a color you like better. baby easter dresses to parade her bebe around. chocolate bunnies in her basket. What to Expect the First Year? What a great site and thanks for having it available! I'm very excited to start receiving the newsletter. 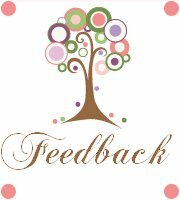 I've checked out your site a couple times and I loooovve how it's arranged, your language, and tips - it's great! 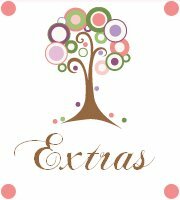 Heather, I can't express how happy I am I discovered your site! 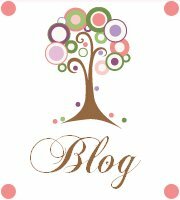 Thank you Heather, for your wonderful newsletter. There is always something new! 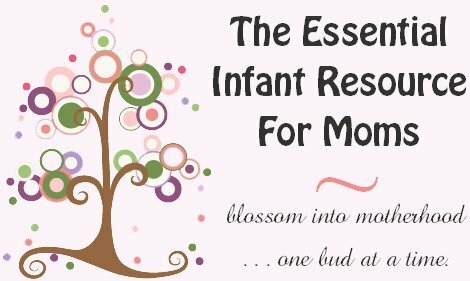 I'm a 1st time young mom, 23 and single, so I have found very very helpful...I can't seem to stop myself telling everyone I know about you, some thought you were my mom! 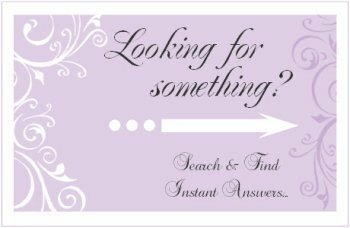 Your website is very helpful and I discovered a couple of great online stores. 'Cause I'm not a big reader, it is very nice that I can find the most important information through your website. Thanks Heather! Your Milestone eBook is SO detailed and so correct. My son is doing all or most of the things and many are not mentioned in the usual books/sites. Great job and keep it up! Thanks so much for creating such an AWESOME website. I really appreciate your sense of humor and real writing style. My baby refused all bottles until you showed me the MAM bottle. Thank you so much for the recommendation. I wouldn't have known about them if not for your website.